Why do I need a cron job? It is important to understand that WP Mailster is a part of WordPress which is a PHP based web application. That means: it can not act/run without being triggered and it can not run forever when triggered. This is a technical limitation coming from PHP, not from WP Mailster or WordPress. Triggering means that somebody accesses the site. During the page load WP Mailster is handling the jobs to do (mail retrieving and sending). Thus mails can only be send/retrieved when somebody is browsing your site, otherwise the delivery is delayed or never done. As your site might not be browsed every few minutes 24×7 we recommend you to use a cron job that opens the site periodically. The differences between the two are explained in the following. This is the easiest way to setup a cron job – we setup a cron job for you. When you are a paying subscriber of WP Mailster, then you already have one cron job included that we will setup for your site. You can do this by logging into your account at our site. There you will find a section where you can manage your cron jobs. Here you can also purchase additional cron jobs or extend the yearly subscription period. We offer the Mailster Cron Job Service as a managed service on subscription basis. It can be booked independently although the following subscriptions are included when you purchase our products. WP Mailster Society: Power Cron Job Service (1 Site, 1 Year) – dedicated! WP Mailster Enterprise: Sprint Cron Job Service (1 Site, 1 Year) – dedicated! 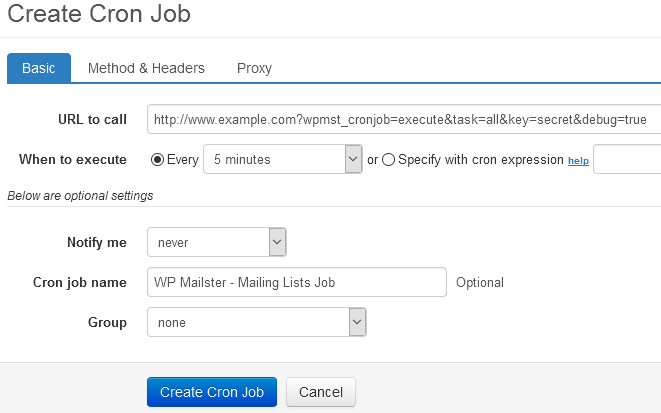 The cron job service can work with all of WP Mailster’s product versions. It uses either the “lazy cron job” or the “dedicated cron job” mode that are described below. If you run more than one WP Mailster installation you can purchase multiple cron job subscriptions as needed. In order to setup a cron job yourself, your hoster either needs to offer cron jobs as part of their hosting package, or you need need to have access to a URL-based cron job service like Easycron.com or Webcron.org. Lazy Cron JobThis type of cron jobs work by simply opening your WordPress site periodically. During the site loads WP Mailster then does its activities (retrieving and sending emails). The downside of the approach is, that loading your site utilizes server resources as the web server renders a page that is never looked at. And, if you don’t follow our instructions below, it may cause delays for your users. This type of cron jobs has the advantage it does not cause page load delays at all.Furthermore, no unnecessary server resources are used. The different tasks types of the dedicated cron job are excellent to run WP Mailster in an optimized manner and ensure ultra-quick delivery. 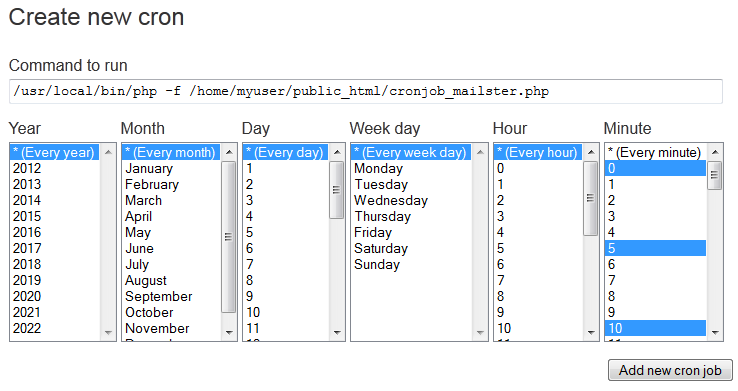 If you can (based on your WP Mailster product edition), then you want to use the dedicated cron job mode given the above advantages. This type of cron jobs work by simply opening your WordPress site periodically. So it basically means a program browses an URL of your site. The (sub-)URL of the cron job is not important, as WP Mailster is working during the pageload and the content of the loaded page itself is not interesting. Don’t slow down your visitors! You want to point a lazy cron job always to the admin login screen (wp-login.php) to avoid too much traffic / false page hit statistics. If you have setup your cron job to point to the login screen, then you can change the Trigger Source in WP Mailster’s setting to “Backend only”. So, in short: setup the cron job to use the URL like http://your-site.com/wp-login.php (replace http://your-site.com with your address and make sure to use HTTPS if applicable). Please read our separate section on where to enter the cron URL. This type of cron jobs have the advantage that they do not cause page load delays for site users at all. Furthermore, no unnecessary server resources are used. We strongly recommend using them. Dedicated cron jobs are only available in WP Mailster Society & Enterprise. You may also want to increase the “Max. execution time” setting, recommended is half of your PHP max. execution time. Dedicated cron jobs work with special URLs. Use only lower- and/or upper-case alphanumeric characters (0-9, a-z, A-Z) in your cron job key. Other characters may need to be manually URL-encoded. This is error prone and can cause the WP Mailster actions to never start. Working with the all task is the recommended dedicated cron job setting and suitable for most setups. all: sends and retrieves emails for all mailing lists. Recommended in most cases, but not recommended for big mailing lists or high traffic lists. fetch: retrieves the emails of the mailbox of one mailing list the emails in the mailbox. While the task all is suitable for most cases, we recommend to use multiple cron jobs (e.g. one with the task fetchall and one with the send task) for big mailing lists (> 100 recipients) or high traffic lists. To check whether the cron job is successfully executed you can copy the cron job URL into the browser and append this: &debug=true. Let’s get back to setting our cron job. As already mentioned: there are different ways to setup a cron job. This depends entirely on the options available to you. You specify the frequency of the cron job executing by selecting the appropiate options. We recommend to create a cron job that is run every 5 minutes. Do this by selecting the every year/month/day/week day/hour option and by selecting multiple minutes in a 5 minute interval (e.g. 0/5/10/15/20/25/30/35/40/45/50/55). You need to pay attention what you insert as the command to run. In the example given, the first part, /usr/local/bin/php on our server, is the path to the PHP executable. This is a little different for each webhosting environment – but in most cases well documented in the hoster’s setup guide. On some servers it is enough to write php or php5 without an exact path. The second part, the parameter -f, tells PHP to parse and run a file. It is optional and may be omitted. The last part is the path to the file, relativ from the root directory (that you can access). A good way to figure out this path is to login via a FTP client and navigate to the root. From this root the whole path to the cron job_mailster.php file has to be used for the cron job command. Most cPanel offer a way to review the cron job result, either by logs or by emails. You should use this at first to see whether you get the desired output (as previously when you accessed the cron job URL with the &debug=true parameter with your browser). This method applies only if you have command-line access to your (Linux) server and the suitable user rights. As the first step create a file named cron job_mailster.php, see the section above on what to put into the file. The * means “every”. So our line makes the cron job run every minute (in every hour, day, month, year). Basically every interval is possible. Many more examples on the crontab’s syntax can found on the web, e.g. on Wikipedia (see http://en.wikipedia.org/wiki/Cron). An alterantive to use the PHP executable to trigger the site is using other applications that act like a web browser. This has the advantage that you don’t have to work with PHP scripting file. Note that you have more options in terms of command-line programs to use (e.g. lynx or curl). You have to see what is available and working on your host. There are many web cron job providers out there. For example Easycron.com and Webcron.org. They all enable you to setup a URL-based cron job relatively easily. You need to enter the URL and define the frequency (here every 5 minutes).